After thorough analysis of your well water, you may want to take corrective measures that would otherwise mitigate any naturally occurring staining, color, odors, cloudiness, sediment, scale that interfere with the waters suitability and shortens the life of household plumbing and appliances. Briefly, water treatment may make use one or more of several different categories of treatment. They are filtration (static and automatic), water softening for hardness scale and soluble iron and manganese, metering dispensing systems to dose water supply with necessary chlorine, soda ash, alum and vinegar where needed and finally, more specialized devises like ultra violet and reverse osmosis round out the basic equipment offering. We have the unique advantage of having almost the entire water quality industry at our disposal for you. We are able to service most brands with the exception of some proprietary franchised systems. While many well drillers may leave water quality to the unsuspecting user, Curtis Drilling feels obliged and therefore maintains an on-site water testing lab dedicated to timely accurate results. We are not a franchise and therefore you are not limited to a short list of methods or inventory. Our water treatment and quality assurance manager has years of experience and expertise diagnosing problems and prescribing the best methods for your conditions and circumstances. Our experience also allows us to customized treatment methods and products that assure you get to select exactly what you need and its been professionally assembled. Water treatment falls into several categories, If you think you need treatment, it will likely take the form of the following types. This includes strainers, sand separators, standard and over sized sediment and specialty housings and cartridges. It also includes automated filtration systems that have the capacity of many cartridge style filters but posses the added advantage of cleaning themselves automatically. All of these style filters are designed to integrate into most private and public water systems and remove solid matter from the water. Lastly, there are more specialized filter systems that rely on a means of oxidation to occur so the dissolved contaminant can effectively form into a removable solid. Proper installation and sequencing is critical to most all systems. 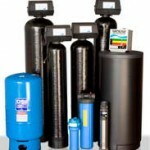 Water Softeners are not filters. They are filled with softener resin (tiny positively charged plastic beads) and operate off the principle of ion exchange. In layman’s terms, water softeners are able to attract certain constituents of negatively charged dissolved rock (calcium and magnesium carbonates that cause white crusting and scale on fixtures) within the water and hold on to them until it reaches its holding capacity. At which time the softener will automatically rinse a salt water solution (brine)over the resin beads. Salt has a stronger positive charge than resin so the dissolved rock on the resin is now more attracted to the salt as they rinse down the drain together leaving the resin regenerated and ready to repeat the sequence. This pertains to the careful and measured way of adding necessary solutions like very small amounts of chlorine and/or soda ash to name two to a water supply. Components within this category include a many styles of metering pumps and contactor meters used for their precision, solution tanks and solution mixers, contact and retention/saturation tanks. All of which are used in concert with on another to provide accurate feed rates, complete homogeneous mixing and proper amount of time for reactions to occur. This area covers more of the industry’s offering. Ultraviolet disinfection systems kill bacteria and the like. Reverse osmosis units filter a low volume of water at high pressure through a semi-permeable membrane thereby “stripping” away contaminants at a molecular level. Point of use filters like counter top and faucet tips are generally less effective and have a short life. We have most methods of treatment in stock and more available.